Happy Monday Everyone! I hope you all had a wonderful weekend and a very happy St. Patty's day. To celebrate the holiday I created a St. Patty's day t-shirt with a little twist. 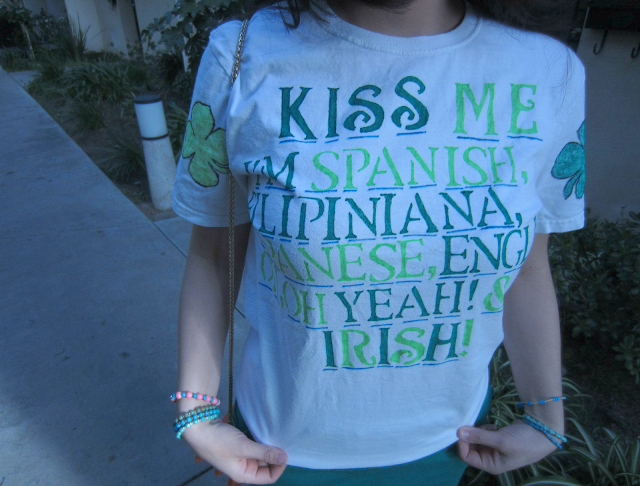 I know we have all seen the typical St. Patrick's day shirt that usually says "Kiss Me I'm Irish." I thought I would take that saying and run with it by making it my own. I come from a mixed background, on my fathers side my Grandma was Irish and my Grandfather was English. On my mothers side my Grandmother is Japanese and Filipiniana and my Grandfather came from Madrid Spain. So I figured I would just put it all out there and say "KISS ME I'M SPANISH, FILIPINIANA, JAPANESE, ENGLISH... OH, OH YEAH! & IRISH! "I mean in order for my to be completely honest there's more than one reason to kiss me. Ha, Ha! I'm just kidding! 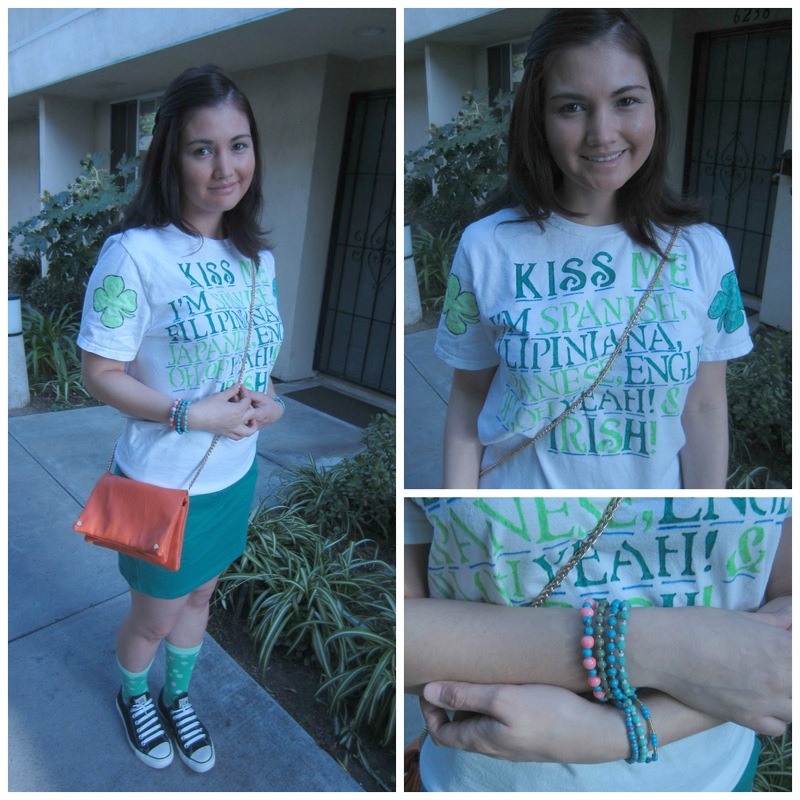 Below are some pics of the outfit I wore on Saint Partick's day. 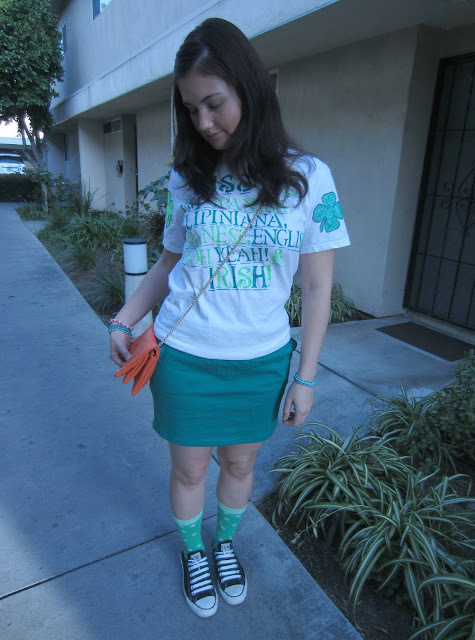 T-shirt: Homemade, Purse: Can't remember the store name but somewhere on Melrose, Skirt: American Apparel, Socks: Old Navy, Shoes: Journey, Bracelets: Handmade by ME! Well that's that! Hope you like my one of a kind St. Patty's day t-shirt! More posts to come your way soon! Thanks for stopping by!